*Steve Plyakas and Mihail A. Dimitri’s journey through the valley of Kalash and Hunza, in Pakistan, discovers successors to Alexander of Macedon. Alexander of Macedon is the great one for his successors, the present day Macedonians, and the great one for every nation in the world. He created and left as heritage the philosophy of bringing together nations, cultures, religions…Hence, Alexander is a great challenge for numerous researchers, scientists, travel-writers, journalists and ordinary mortal beings, who treat him with respect, love, and strong faith in the past, the presence, and the future. 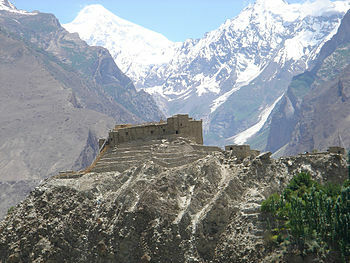 This is also the case with Steve Plyakas and Mihail A. Dimitri’s challenge to travel to northern Pakistan. The book titled “In Search of the Macedonians in Pakistan” came as the result of this long, painstaking and interesting trip. This book, modest in pages, yet large in events, represents a kind of travelogue about the “campaign” of Steve Plyakas, a Macedonian from Canada, and Mihail A. Dimitri, an American of Macedonian descent. The book was first published in English, but was recently published in Macedonian, which signifies a significant contribution towards the clearing up of the truth and enigmas related to Alexander of Macedon. Published by the publishing house “Alexandra” P.O. Box 5321, Fort Wayne, Indiana, the text was translated by Ilina Jakimovska, and edited by Aleksandar and Pavlinka Georgiev. His companion, and like-minded friend, Steve Plyakas, was initiator and sponsor of the long journey to Pakistan. He is a well-known and distinguished Macedonian emigrant from Toronto, whose roots go back to the village of Zelenitche, near Kostur. Steve and his wife, the charming Lilly Plyakas, are virtuous Macedonians and donators. They donated a kidney machine to the hospital in Skopje, provide financial assistance for activities of the Macedonian organisations, folklore societies, clubs, and other kinds of associations. Among other things, Steve Plyakas was also president of the Macedonian organisation, “United Macedonians” in Canada, and is now the president of the Macedonian Orthodox Church of “St. Clement Ohridski” in Toronto. He is the man who carries Macedonia in his heart, and gives it his strong love and sincere respect. This thought troubled Steve Plyakas, who invited Mihail A. Dimitri in 1995 to take part in the research in Pakistan. They arrived there in July, 1995, first in the city of Ravalpindi, later going to Chitral, finally reaching the valley of Kalash and Hunza, where according to some sources, descendants to the soldiers of Alexander of Macedon live today. The purpose of this journey was to gather evidence for knowledge and records on Macedonian culture throughout the world, to prove that the Macedonian tongue, customs, traditions, and other characteristics are recognisable. The conclusion of the book “In Search of Macedonians in Pakistan” tells us that this is not full research, but merely evidence of the first steps made towards a better understanding and lightening up of Macedonian culture and history. Therefore, deeper and much more extensive research is necessary. The author hopes that his journey will motivate other journeys. Steve Plyakas is now preparing to start similar research of Anadolia, Persia…He continues to point out that the Macedonians remained behind in Northern Pakistan in the course of Alexander of Macedon’s conquests and they retained their culture. The book contains information that Steve Plyakas and Mihail A. Dimitri found traces and symbols characteristic of Macedonian culture. Thus, they found the same geranium flower in the valleys of Kalash and Hunza as could be found in Macedonia from as early as the ruling of Philip II until the present day. The author states that the symbol of the flaming Macedonian Sun with rays could also be seen in the valley of Kalash and Taksilla, the grape vine is a symbol in Macedonia and the two Pakistani valleys, and the symbol of snakes represented in various ways can also be found. Folk dress in Taksilla were very similar to some costumes in Macedonia. This was also the case with some traditional folk dances in the region. They also found a large number of words in the Kalash and Hunza tongue which are similar to those used in Macedonian. This too, can serve as motivation for further research. According to the author, the influence of a defined, independent Macedonian culture over the people in Northern Pakistan is indisputable. Steve Plyakas and Mihail A. Dimitri’s journey clearly shows that this connection does exist and it deserves further research for greater accomplishment.